Latest post Sat, Dec 27 2014 6:36 PM by AndrewAction. 4 replies. When you start working in Pro Tools for any length of time you'll most likely find yourself reaching for an EQ and compressor on virtually every song you mix. And if you're like me you tend to stick with one go-to EQ and compressor instead of changing it up a lot. 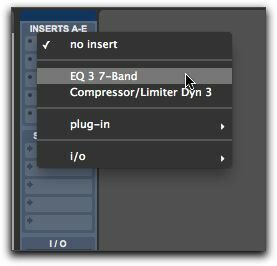 Not that this takes a whole lot of time to digging for your main plugs, but Pro Tools has a setting that allows you to choose your default EQ and compressor which makes them much easier to find and will save you some precious time in the long run. Let's take look at this quick optimization. Simply head up to the Setup menu, click and choose Preferences. Once the Preferences dialog box opens, click on the Mixing tab and look in the top left section of the box labeled "Setup". You'll notice drop down boxes next to Default EQ and Default Dynamics. Any EQ or compressor/limiter you have installed in Pro Tools will show up here. Simply choose a plugin for each category and click OK.
Now, any time you insert a plugin on a track, your chosen default EQ and compressor will show up in the menu just above your plugin categories. You don't even need to go digging for them in their respective folder. Talk about convenient! Just another way to save time in Pro Tools and focus more energy on making music instead o fmessing with software! Cool trick. There's another way of doing this; check the AIR Users Blog for the video. If there were any plug-ins in the Setup none under Default EQ and none Under Dynamics under none is none and under default selection is 1 EQ AIR KILL and none, protools choices in protools 10/11 bundled. one total choice. The program does nothing. ALL my pro tools FILES ARE NOT SONGS OR VIDEOS THEY WOUND UP BEING NAMED AS PRO TOOLS "SYMPTOMS" OF THE ATTEMPTED CREATION OF ANOTHER PROTOOLS DESTROYED SONG SESSION- IN PRO TOOLS FILES for instance one session file is called "song 1 no sound" the next session is called " sonata1 protools lost plugins" "sonata 1 protools deleats factory plug ins" "sonata 1 protools plug-ins (save) means deleat plug-ins path" "sonata 1-no map or mapping protools can't find path" So " SONATA 1 template can't be saved under song file name"( in my own defense I didn't name the file as a folder of the same name) PROTOLS DID!!!) comes up as ERROR" template of the same name" AN EMPTY FOLDER named "TEMPLATE OF THE SAME NAME" literally is what PROTOOLS named the song file template as a folder and placed it under the default SETUP setting of the original session under say, ((music or eleven rig reamp or whatever the original sesion was created in from startup)) in a folder named by protools now called "Template of the song name" Under protools session templates however the SONG NAME WAS "SONATA1"not "Template of song under song name" So start a new song because protools give files folders names and turns them into folder of the same name as the file is named the same as the file folders and inserts same name files into it trying to name it a template Then instead of opening the file as comanded it your choices are "replace file? yes or no"...... wtf No in protools means close the program and yes means load the settings over again providing pro tools didn't change it's default to a different kHz 44.1 to 48 or switch the bit rate back to a default 24biterate instead of going back to the preset 16bits manually saved. However user presets are gone along with the data, plug-ins factory download, Maps, paths to presets and last but not least protools says "You can't open that file because the name already exists. Please choose another" WTF? I named it!! so i could find it an open it and not allowed to open it because it's named I gave Exists?????? What format is protools on? I'm on -OPEN CREATE PRESET SAVE PRESETS SAVE CREATION AS" NAME" SAVE (named) creation in DIFFERENT NAMED FOLDER CLOSE. Open folder to named file click file opens creation in program as it and all it's presets and plug-ins, maps and paths were saved before closing.